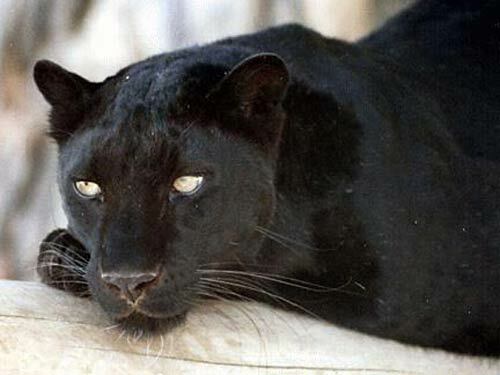 The Panther / Black Panther is not a distinct species itself but is the general name used to refer to any black coloured (melanistic version) feline of the Big Cat family, most notably Leopards and Jaguars. “Melanism”is the genetic term for full color black. There are no Pink Panthers (contrary to the movie series with Inspector Closeau). 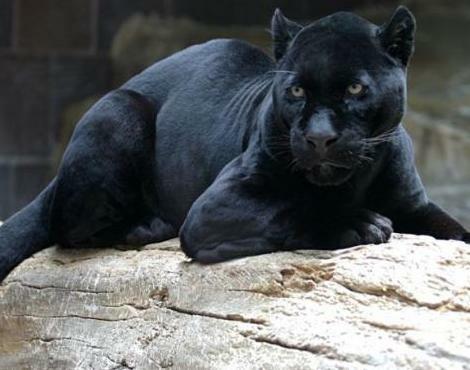 The Panther is an elusive and powerful animal that has adapted well to a variety of habitats around the world, and is known to be one of the strongest climbers of all felines. Although the Panther is not technically classified as a separate species, they are considered to be endangered by many due to the declining numbers of both leopards and jaguars throughout much of their natural ranges. 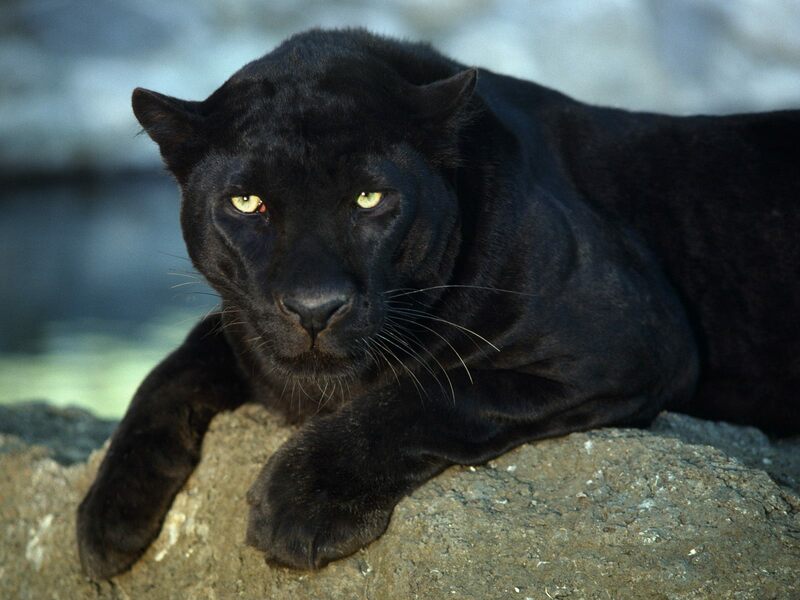 Tthe term “panther” is also used to describe a number of other dark coated cats by locals in their native habitats, including Cougars, Tigers, Pumas, Lynxes and Bobcats. More information about Panthers on the Animals A – Z site. The Jaguar is the third biggest cat in the world behind the tiger and the lion and is well known for it’s immense power and agility. The name Jaguar is said to come from the Native American word yaguar which means “he who kills with one leap“. These beautiful and powerful beasts were prominent in ancient Native American cultures. The Jaguar is indigenous to the Western Hemisphere, where it primarily inhabits the tropical rainforests of Central and South America. Its Conservation Status is “near threatened”. Jaguars have the strongest bite force of all cats and like other ‘big’ cats they can roar. Although Jaguars usually have yellowish coloured fur, other colours are also known including black and white. Unlike many other cats, jaguars do not avoid water; in fact, they are quite good swimmers. Rivers provide prey in the form of fish, turtles, or caimans—small, alligatorlike animals. Jaguars also eat larger animals such as deer, peccaries, capybaras, and tapirs. The Leopard is a medium-sized wildcat that is natively found in a variety of habitats across sub-Saharan Africa and southern Asia. There are seven different sub-species of Leopard which differ in their appearance and geographic location. Leopards can vary greatly in their colouration and markings depending on their surrounding habitat, with those found on open grasslands having a light yellow background coat where those that are found in forests tend to be darker in colour and with more markings. The dark, ring-like patterns that cover the Leopard’s coat are called rosettes, but these turn to solid spots on the face and limbs (and rings on the tail) and provide the Leopard with camouflage into the surrounding environment. Leopards are incredibly strong and muscular and are able to pull themselves up trees using their legs and retractable claws. Leopards are not only the widest ranging of all big cats but are actually one of the most adaptable and are found in a variety of habitats. Commonly found throughout sub-Saharan Africa and southern Asia, there are also small and isolated populations of Leopard inhabiting remote geographic locations in the Far East, Northern Africa and Arabia. The Leopard is a solitary and nocturnal hunter that hunts both on the ground and in the trees. They are excellent climbers and spend the majority of the daytime hours resting in the shade of the branches in the trees or under a sheltered rock. They are quite unique among large felines as Leopards rely heavily on being able to get close enough to their prey before ambushing it, rather than expelling vast amounts of energy in a high-speed chase. Black Panthers (Leopards) tend to occur most in dense forests with larger populations being found in southern Asia than in Africa, and are born into a litter that also has yellow cubs. Black Panthers are actually fairly common and it is thought that up to 50% of the Leopards found inhabiting the thick, tropical rainforests of the Malay Peninsula are black. Today, the Leopard is listed by the IUCN as being an animal that is Near Threatened in its natural environment as populations are stable throughout much of its vast natural range. A number of Leopard sub-species however, are considered to be either Endangered or Critically Endangered in their native habitats and one is thought to now be extinct. More information about the Jaguar can be found on this site by clicking on the link below.